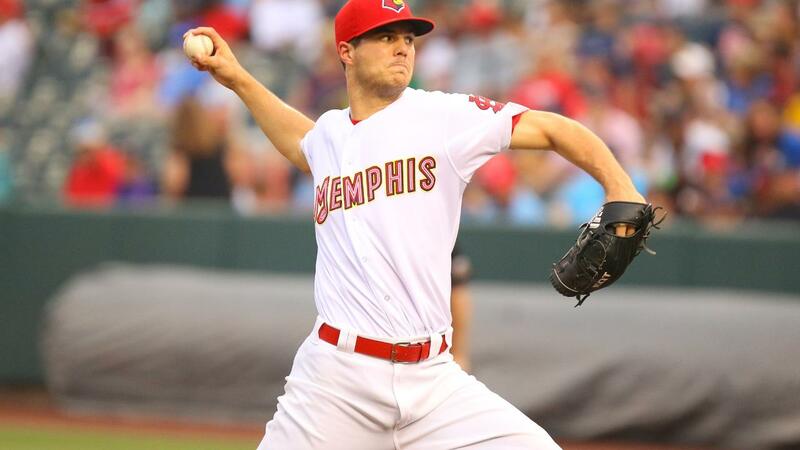 MEMPHIS, Tennessee - Memphis Redbirds right-handed pitcher Dakota Hudson has been named the Pacific Coast League Pitcher of the Year, the league office announced Thursday. Hudson won this award despite spending the last month with St. Louis. He received over 85 percent of the votes for the honor. Hudson dominated the competition in his first full season at the Triple-A level. Hudson went 13-3 with a 2.50 ERA in 19 starts with Memphis before being promoted to St. Louis. In 111.2 innings with Memphis, Hudson allowed just 31 earned runs, one home run, and 38 walks, while striking out 87 batters. Opponents were hitting just .254 (107-for-422) off the righty before his promotion. Had Hudson pitched just 0.1 more innings, he would have set the record for best ERA in a season in Redbirds' history. His 13 wins is tied for second-most in a single season in Memphis history. Although he hasn't pitched for Memphis since July 25, he still leads the PCL in wins and ERA. He had 11 quality starts this season, and had four outings where pitched eight innings, allowing one run or less. Hudson's dominance with Memphis this season led to his first Major League call-up. He was pulled after one inning in his last start with Memphis, having been promoted mid-game. He made his Major League debut on July 28, throwing one scoreless inning, and striking out two against the Chicago Cubs. In 14 relief appearances with the Cardinals, Hudson is 4-1 with a 3.07 ERA in 14.2 innings of work. This is just one of many honors Hudson has earned so far this season. The righty and teammate Tyler O'Neill were named to the All-PCL Team earlier this week. Additionally, Hudson was named the starter for the PCL in the Triple-A All-Star Game, participated in the MLB Futures Game, and was named the Cardinals Minor League Pitcher of the Month for June. Last season with Springfield, Hudson was named the starting pitcher for the North Division in the 2017 Texas League All-Star Game, was named a Texas League Postseason All-Star, and was the first Springfield player in history to win the Texas League Pitcher of the Year honor. Like this season, Hudson was promoted and did not appear at all for Springfield in August and September last season, but still won the award. Memphis and Round Rock will play their series finale tonight at 7:05 p.m. before Memphis heads to Nashville for four games to finish the regular-season. The Redbirds will begin the playoffs on the road on Sept. 5 before coming home for game three on Sept. 7. Redbirds playoff tickets are on sale now and can be purchased at www.memphisredbirds.com/playoffs.